Some of you know that when I’m not shooting my own weddings, I enjoy shooting alongside other photographers when brides request a second photographer on their wedding day. I’ve been so fortunate to work with some of the most talented Colorado photographers, and I’ve also had some of the best photographers in the United States find me when they are going to be shooting a wedding at Aspen, Vail, or one of Colorado’s many other mountain resorts. For this particular wedding, I second shot for the lovely Christine of Dabble Me This, based in Chicago. It was so fun spending the day with her and this super fun wedding party, going from the Beaver Creek to the top of Vail Mountain, then finishing off the day with a tented reception outside one of Vail’s most iconic hotels. We loved this bride’s simply, classic gown, the understated elegance of the groom’s tux, and the soft, flowy bridesmaids dresses in muted pink. You’ll notice attention to the groom’s details in this gallery, since the second shooter often has the opportunity to spend more time with the groom and groomsmen while the primary photographer captures the bride and her maids. I also enjoy capturing a wedding day with a more candid and photojournalistic touch when I’m the second photographer. It’s a great way to capture those in-between moments that help make the wedding album complete. 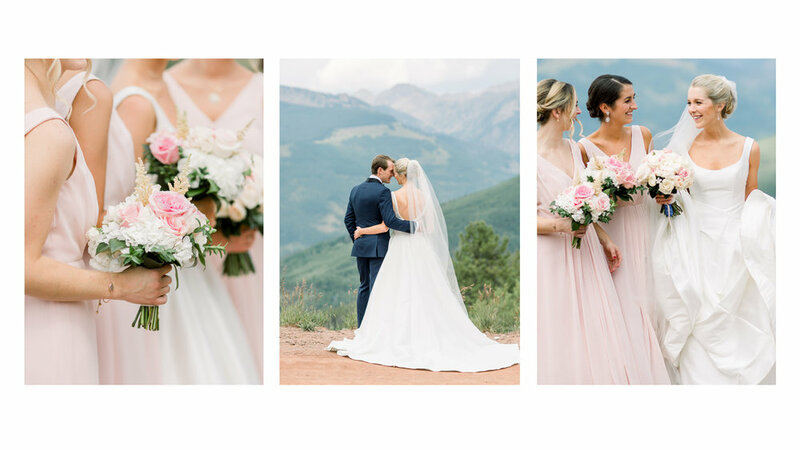 Thank you for having me join you, Christine, for this gorgeous Colorado mountain wedding!